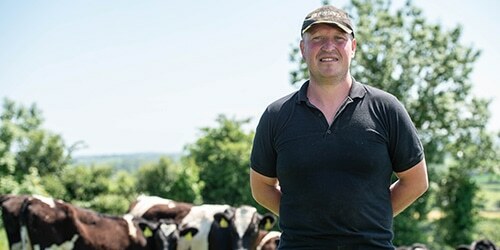 "Last year we saved money on blend because the quality of forage was better and cows are performing so well on the diet"
Adding probiotic yeast to the diet at Hare Appletree Farm has helped farmer, Andrew Metcalfe, improve milk yields whilst achieving more milk from forage. Andrew farms in partnership with his mother, Christina, and father, John, on a 250-acre traditional mixed hill farm in Quernmore, Lancaster. The farm has a herd of 85 cows and flock of 450 sheep, both of which graze the farm’s traditional pastures. The herd is mostly made up of British Friesians, which suit the farm’s system and location – some 400 metres above sea level with stony, heavy, clay soils. The herd calves all-year-around and replacements are reared on the farm. One of the main limitations on the farm is having to use the same fields for the sheep and lambs, as well as for the cows and silage. “It’s a balancing act,” explained Andrew. 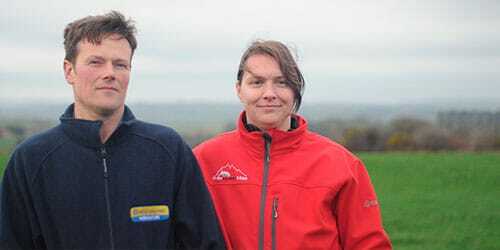 “We can only take two silage cuts as there isn’t enough time to do three by the time we’ve lambed and can move the sheep off the grazing land and on to the moorland, so we focus on getting the best quality from those two cuts,” said Andrew. Quality of grass is also a limiting factor and Andrew is in the process of reseeding some areas of the farm. Following the introduction of the new approach to feeding, milk yields have risen steadily and now stand at 9,000 litres/year with butterfat at 4.2 per cent and protein at 3.2 per cent. 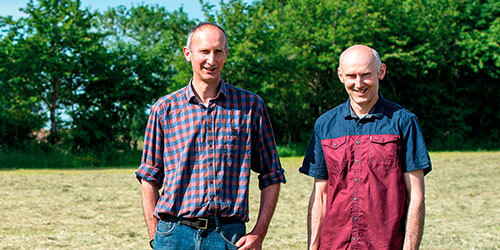 “Importantly for us, 3,000 of our litres are from forage and, since introducing Rumisaf into the diet, litres from forage have increased by around 800,” said Andrew. While this improvement can’t all be attributed to the addition of yeast, Andrew feels it certainly played a role alongside better forages. “Last year we saved money on blend because the quality of forage was better and cows are performing so well on the diet,” said Andrew. 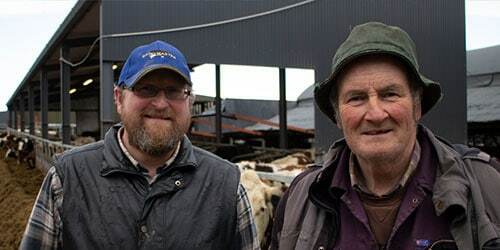 “The results speak for themselves, we were at 7,500 litres/year and we’re now at 9,000. The cows are healthy and look well, we don’t see any rumen upsets and we have seen the improvements in yield – the new approach works well and I’m pleased with the response from Rumisaf,” he concluded.